You should know that the Survey of India has been illegally depicting inter alia the border of Kashmir wrongly and depicting large of areas in Kashmir illegally as not part of India. At the time of the accession of the princely state of Kashmir to the rest of India, Kashmir extended to the water shed of the Kuen Lun range in the edge of the highlands of Kashmir, and also beyond. Nehru himself conceded this. To quote Nehru himself from his telegram dated 26 October, 1947 to the British Prime Minister, Clement Attlee, he says, "Kashmir's Northern frontiers, as you are aware, run in common with those of three countries, Afghanistan, `the Union of Soviet Socialist Republics' and `China' ". This is only possible only because inter alia Dafdar in the Taghdumbash Pamir in Kanjut is part of Kashmir. The territorial extent of the State of Kashmir is as stipulated in Entry 15 in the First Schedule of the Constitution of India. Two maps, viz. The official maps attached to the White Papers published in July 1948 and February 1950 by the Government of India's Ministry of States, headed , incidentally, by Sardar Vallabhbhai Patel, under the authority of India's Surveyor General G.F.Heaney give them the legal status to determine the extent of the State of Kashmir as stipulated in Entry 15 in the First Schedule of the Constitution on India. The said official maps presented with the White Papers prove that the northern border of Kashmir with East Turkistan at the time of the accession of the state to the Union of India was on the Kuen Lun Range, the natural and historic border of Kashmir with neighbouring Trans-Kuen Lun State of East Turkistan. Pertinently, it is imperative to note that areas shown in colour in the aforesaid maps includes areas which are illegally not depicted as part of Kashmir by the present office of the Surveyor General of India presently. 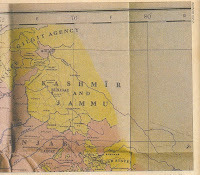 Also pertinently, though only part of the 1948 map of Kashmir is shown in colour, the caption or legend Gilgit Agency is depicted well, extending to the areas of Kashmir not shown in colour, to the area to the east of 76 degrees East Longitude beyond the Aghail and Karakoram ranges and beyond the Raskam river within the area of Kanjut, near the Kuen lun range and Mariom and Taghdumbash Pamir, i.e. the area which at present is illegally not depicted as part of Kashmir by the Surveyer General of India , which unequivocally, and with out an iota of doubt proves that even those areas of Kashmir not shown in colour up to the Kuen Lun range are integral and inalienable parts of Kashmir. If there had been any apprehension or ambiguity about the territorial extent of Kashmir, then the captions or legends Gilgit Agency and Kashmir would definitely not have been shown extending beyond the area shown in colour. It is even explicitly admitted by the Government of India in its publication, viz., `Atlas of the northern frontiers of India', wherein it is stated in the map at page 20 that the British cartographers gave a dark shade for areas only where they had their jurisdiction and in the rest of India, only a lighter shade was used. The very same publication also portrays an ancient old Chinese map which depicts the southern boundary of East Turkistan with India along the Kuen Lun Range. But however, the Survey of India, hand in glove in collusion with the Chinese, illegally depicts the northern border of India illegally at the Mintaka and Khunjerab passes and not to the north of Dafdar and on the Kuen Lun range in northern Kashmir inter alia on the Kukalang north of Bazar Dara in Kanjut, Yangi north of Kulanaldi in Kanjut, Kilian including Khathaithum, Sanju and Hindutash passes in Ladakh northern Kashmir.The fact that the aforesaid 1948 map did not extend the colour wash to the whole of the state is irrelevant since the plethora of maps of Kashmir published before 1947 including inter alia, way back, the 1909 map of Kashmir titled the map of the "North West Frontier Province and Kashmir" from the Imperial Gazetteer of India, 1909, had depicted almost the whole of Kashmir till the undefined line just short of the border of Kashmir on the Kuen Lun range where there had not been a formal demarcation of the Water shed of the Kuen Lun range to enable the depiction of a defined border . Also, the map from the article, "On the Geographical Results of the Mission to Kashghar, under Sir T. Douglas Forsyth in 1873-74" by H. Trotter, Journal of the Royal Geographical Society of London, Vol. 48. (1878), pp. 173-234, The Geographical Journal, Vol. 37, No. 3. (Mar., 1911), pp. 275-280, too depicted the areas of Kashmir not included in the colour wash in the aforesaid 1948 map till the undefined line just short of the border of Kashmir on the Kuen Lun range, and any extraneous ulterior motive imputed to the fact that the aforesaid 1948 map did not extend the colour wash to the whole of the province, by prejudiced persons with vested interests working in collusion to sub-serve a hidden anti- national agenda would be summarily exposed by this fact. In 1954, Prime Minister Jawaharlal Nehru had, out of the blue,stealthily and surreptitiously published for the first time , a new map of Kashmir. In June 1954, Zhou Enlai, Prime Minister of China was in India, and in the October of the same year Jawaharlal Nehru went to China. In between, Nehru issued a memorandum which stated inter alia that the frontier should be considered a firm and definite one , which is not open to discussion with any one. A system of check posts should be spread along this entire frontier. How did he go about doing this? In 1954, thus a new official map of India was published out of the blue, stealthily by Nehru, referred to here as the `Nehru Line' which dropped the legend undefined `and showed the northern border of Kashmir with a clear firm line. Nehru, in accordance with his Memorandum which stated that the frontier should be a firm and definite one, arbitrarily, and illegally depicted a border of Kashmir which ran well in the interior of Kashmir depicting only those areas of Kashmir which according to him was definitely part of Kashmir and beyond dispute, thus depicting large areas of Kashmir as not part of Kashmir, so as to make the border of Kashmir undisputed , and thus definite and firm, and leave no room for any future controversy. It is inevitable that the obnoxious Nehru Line which Nehru unilaterally and arbitrarily published for the first time in 1954 in accordance with his own perverted whims and fancies and is blatantly ultra vires the Constitution of India and has absolutely no legal sanctity, and is ab initio illegal, will be repudiated by the proud people of India. Pertinently , it is imperative to note that the Director of the Intelligence Bureau , B.N. Mullik had recommended the setting of new posts in Kashmir in 1959 ,at inter alia Sarigh Jilganang Kol and Palong Karpo which was discussed in January 1959 at a meeting in the external affairs Ministry in the presence of Gen Thimayya , Chief of the Army staff and the Foreign secretary. Both the Army Chief and the Foreign Secretary had opposed the proposal to open border posts at inter alia Sarigh Jilganang Kol though Sarigh Jilganang Kol was situate deep inside Kashmir even according to the obnoxious conservative ‘Nehru Line’ because according to them, the opening of the said posts would ‘provoke’ the Chinese , and create tension. The attitude of the External Affairs Ministry (hear,hear) was that “this part of the territory was useless to India. Even if the Chinese did not encroach into it , India could not make any use of it . The boundary had not been demarcated and had been shifted more than once by the British”. (Mullik , The Chinese Betrayal, page 204)(The northern border of Kashmir with Khotan and East Turkistan continues to be in the Kuen Lun range see the map above which is an extract from the Map referred to in Article 9 of the Simla Convention between Great Britain, China and Tibet dated the 5th July 1914, depicting the southern border of Khotan and East Turkistan with Kashmir on the Kuen Lun range in the area of Hindutash in Kashmir as a red line. 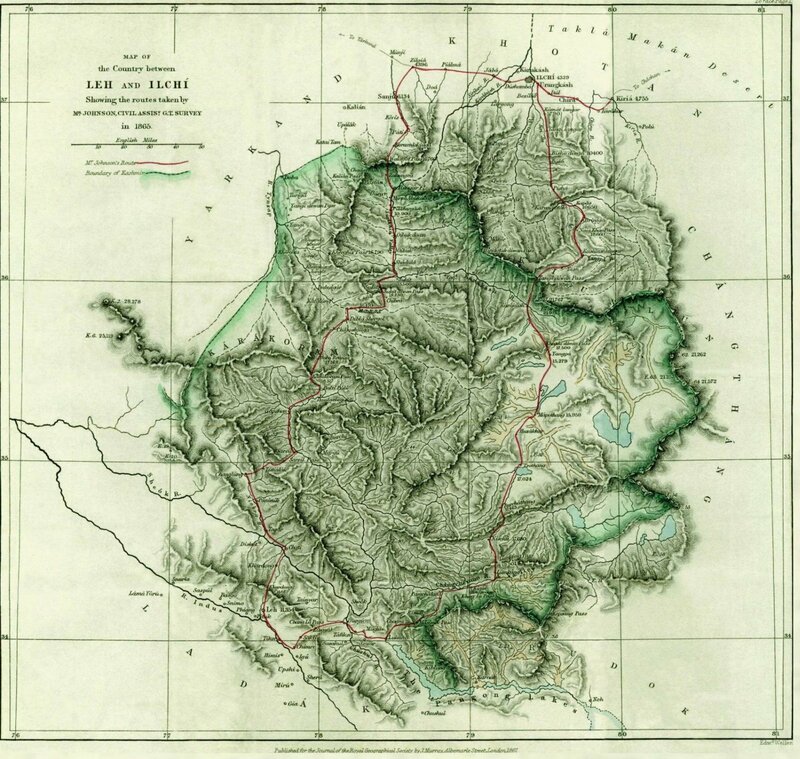 The map was initialed by the British representative and signed by the Tibetan and Chinese representatives. The latter two did not merely initial the Convention but signed it. )Thus Nehru and his fellow Anti-National coterie of bureaucrats did not have the conviction or care to have even an iota of intention to protect even the territory which was admittedly part of India by even the obnoxious , illegal, arbitrary , ingenious and unilaterally stealthily drawn ‘Nehru Line’ of 1954 which Nehru was duty bound to protect , sitting as he was in the chair of the Prime Minister of India, which in the first place was purportedly drawn well in the interior of Kashmir to only serve the purpose of ‘a firm and definite’ frontier ‘not open to discussion with any body’ as issued in Nehru’s memorandum of July 1954, and in 1958 we have the External Affairs Ministry illegally espousing the cause of the Chinese disputing that the area was intrinsically part of Kashmir by the statement ‘the boundary had not been demarcated and had been shifted more than once by the Britishers’. Also pertinently , Nehru by his denial of permission to open posts at inter alia Sarigh Jilganang Kol disobeyed and defied his own undertaking to the nation in his July 1954 memorandum wherein he had unequivocally stated that ‘a system of check posts should be spread along this entire frontier. More especially, we should have check posts in such places as might be considered disputed areas, which only shows how unscrupulous a person, he was. A view of the adjacent pre- 1947 Survey of India map ( See map in the left ) would reveal that the legend “undefined” , is depicted in the vicinity of 37 N.latitude 76 E. longitude not on the Raskam river but well beyond (to the north of ) the Raskam river in Kanjut in Kashmir just short of the watershed of the Kuen Lun Range in Kashmir. (So much for persons like Mr. Noorani and his lot) So If Mr. Nehru had the interests of our nation in his heart and really wanted a firm and definite border the only thing that he was logically expected to do was to do was to depict the border to the north of Dafdar and on the watershed of the Kuen Lun range on Kukalang Pass to the north of Bazardara in Kanjut , Yangi Pass north of Kulanaldi in Kanjut , and Sanju and Hindutash passes in Ladakh. What right did he have to as per his whims and fancies and in consonance with his mindset to illegally draw the Nehru line on inter alia the Khunjareb, Mintaka and Karakoram passes deep in the interior of Kashmir in central Kashmir? The whole of the Nehru line is ab initio illegal and null and void. In any other country such an atrocious act would have resulted in an outroar and revolution. But our nation was pathetically oblivious of this criminal act and Mr. Nehru could get away with it! The only solace now for the proud people of India is that the obnoxious Nehru line is so bereft of legal sanctity, and is ab initio illegal, and null and void and is awaiting repudiation and consequential denunciation of this wicked act of Mr. Nehru. Now the Government of India is covertly illegaly conspiring with the Chinese to compromise even this area within the so called frontier which was meant to be considered a firm and definite one, not open to discussion with any one. If China has the audacity to claim Arunachal Pradesh which is situate beyond the edges of the Plateau of Tibet, then India should also claim Khotan which is also geographically similarly placed and is beyond the edge of the highlands of Kashmir at Hindutash in Kashmir which is the southern border of Khotan. If China is claiming vast alienable and integral parts of Kashmir like inter alia the Aksai Chin, Raskam, Shimshal and Shaksgam valleys in Kashmir, it is tantamount to claiming the Karakoram range which is the interior main watershed in the highlands of Kashmir, and India should then claim the Nyenchen Thanglha range which is the interior main watershed in the Plateau of Tibet as the border of India. Only then would the so called border talks be meaningful and make some sense, and India not subservient. If the Chinese are recognising Sikkim which is predominantly beyond the edge of the Plateau of Tibet as a part of India, India should reciprocate and recognise a similarly geographically placed Chinese territory which is beyond the edge of the Plateau of Tibet like Gansu on the Sino-Tibetan International border as part of China. On the other hand the subservient Indian government has surreptitiously and illegally recognised occupied Tibet, a vast occupied country as a mere province in China purportedly in exchange of the alleged Chinese recognition of Sikkim one of the numerous former princely states in India as part of India. India should follow up on the Dalai Lama's statement that India has more sovereignty over Tibet than does China. It is inevitable that India will sooner or later, denounce and repudiate Nehru's betrayal of Tibet and recognise Tibet as an independent Country.